The Theatre and Dance Department at Gustavus Adolphus College is proud to present Trojan Barbie by Christine Evans, an award-winning pl ay that thrusts a 21st century heroine into a prisoner-of-war camp alongside famous characters from Greek playwright Euripedes’ Trojan Women, such as Hecuba and Cassandra. 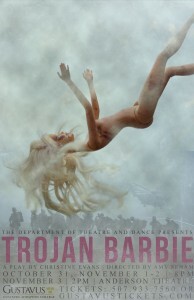 Directed by Amy Seham, Trojan Barbie will be performed in the Anderson Theatre on October 31, and November 1-2 at 8 p.m., with a matinee performance on November 3 at 2 p.m.
Playwright Evans’ Trojan Barbie lives up to its subtitle, and is indeed a modern day crash encounter with the women from Euripides’ famous anti-war play. Through an imaginative time warp that references the wars in Iraq and Afghanistan as well as the Trojan War, Evans sheds new light on a never-ending cycle of violence and victimization. She explores the human cost of war with warm compassion, vivid poetry, and intelligent humor—creating a gripping theatre experience. The cast of this intriguing mash-up of Greek tragedy with contemporary stories of women and war highlights the talents of many women on the Gustavus Campus, featuring nine women’s roles played by a range of students from first-years to seniors. Trojan Barbiealso features an Artistic Team including the Lighting Designer, a junior theatre major named Kitrina Baumer. John Olive is the Scenic Designer, Larissa McConnell the Costume Designer, and Terena Wilkens serves as the Technical Director and Sound Designer. The Production Team of Trojan Barbie features seventy-eight different positions from assistant stage managing, to wardrobe crew, to dramaturg, to scenic and lighting technicians. Performance dates and times for Christine Evan’s Trojan Barbie are October 31, and November 1-2 at 8:00 p.m., and a matinee performance on November 3 at 2:00 p.m. Tickets for this exciting production are available online at www.gustavustickets.com, or by calling the Gustavus Ticket Center at (507) 933-7590, or in–person at the Campus Activities desk in the lower level of Jackson Campus Center. Tickets are $9.00 for adults and $6.00 for seniors and non-Gustavus students. Gustavus students and staff receive one comp ticket each. Tickets not purchased in advance may be purchased at the Anderson Theatre Box Office beginning one hour prior to curtain.